If you're trying to cut down on carbs, spaghetti squash makes an excellent pasta replacement. Because it's a vegetable, the texture is a little different, but it has a good mild flavor and the sauce is still the star. Seasoned ground beef and tomato sauce make this spaghetti squash dish a complete meal. The spaghetti squash is separated into strands and then baked with a beefy tomato sauce and cheddar cheese. Use ground turkey or Italian sausage in place of the beef, if desired. See the tips and variations below the recipe. If you aren't counting carbs, serve this dish with crusty bread and a tossed salad. 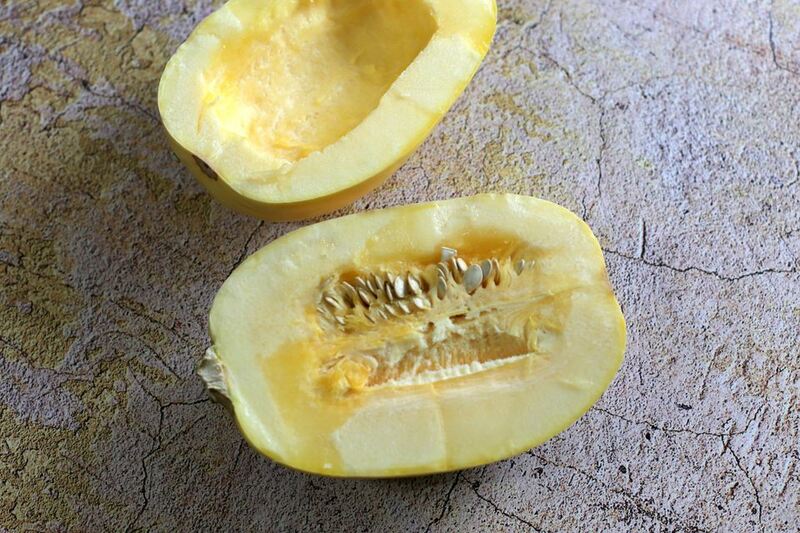 Cut spaghetti squash in half lengthwise and scoop out seeds, scraping with a spoon to get all of the excess fibers. Place spaghetti squash, cut side down, in a baking dish; add water to the baking dish. Cover and bake spaghetti squash in the preheated oven for about 30 minutes or until the spaghetti squash is tender and easily pierced with a fork. When the squash is cool enough to handle, scoop out the "spaghetti" strands with a fork. Put the squash strands in a bowl and set aside. Meanwhile, in a large skillet or saute pan over medium heat, cook the ground beef, onion, red and green peppers, and garlic until meat is no longer pink and vegetables are tender. Drain off fat; add tomatoes, oregano, salt, and pepper. Stir in the spaghetti squash strands. Continue to cook and stir gently for about two minutes or until liquid is absorbed. Transfer the mixture to a lightly greased one-and-a-half- to two-quart casserole; stir in one-and-a-half cups of shredded Cheddar cheese. Bake at 350 F for 25 minutes. Sprinkle with the remaining one cup of Cheddar cheese and cook for five minutes longer or until cheese is melted. Replace the ground beef with ground turkey or bulk Italian sausage. Add about 1/2 teaspoon of crushed red pepper flakes to the sauce mixture for heat, if desired. Use crushed tomatoes instead of diced for a smoother sauce.